I designed and built this pulpit for a Unitarian Universalist church. The minister wanted "something that doesn't feel like a cage." 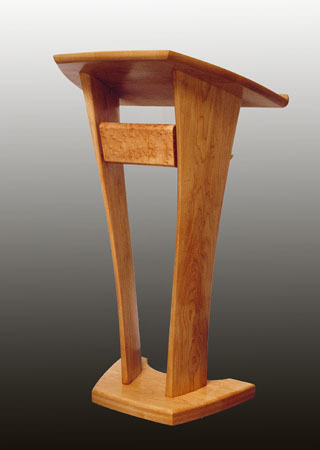 Though appearing delicate, the pulpit is built of solid hard maple. It is a heavy piece, and it stands firmly. The crosspiece, of birdseye maple, hides a shelf. Wiring for a light and microphone runs inside one of the supporting legs. The smooth curves were hand-planed to shape. The pulpit has a satin lacquer finish.